Large Black Leather Handbag from ' Annabel Thom Designs' of Kenya. Annabel Thom is well known in eastern Africa for her unique style and high quality bags and fashion accessories. We are able to offer a limited stock from her collection at these special introductory prices. This large bag is made from the highest quality soft black leather with shoulder strap and attractive stitching and Masai beaded detail to the outer bag. 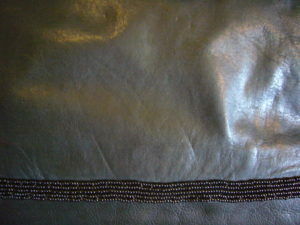 The bag is lined with magnetic fastener. 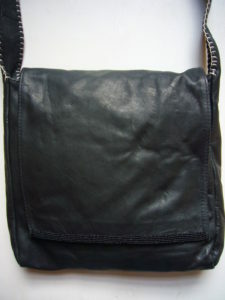 Bag dimensions: W30cm x L27cm x D5cm.